U.S. retailers are finding out what jilted wives and girlfriends have known for years: Men are cheap. As stubbornly high unemployment rates -- which have been slightly higher for men than for women -- have kept many men out of the workforce for months, if not years, men have been taking on more of the household shopping. And, on average, according to a Nielsen report released last week, they've been spending less. Since 2004, men have increasingly accounted for a higher percentage of the household dollars spent at discount stores, mass merchandisers, warehouse or club retailers, convenience stores and supercenters. Their spending has grown the most at dollar-store and warehouse-club retailers, and they also spend more money than women at convenience stores and gas stations, according to the report. "While women continue to dominate shopping trips in all retail channels except for convenience stores, men have increased trip shares between 2004 and 2010 in all retail channels but drug stores," Nielsen says. The higher percentage of male shoppers hasn't boded well for most store owners, who already have taken a hit from the high unemployment rates. It turns out that men are more cost conscious about household shopping than women, Nielsen says. On average, men last year spent 24% less per trip to a supercenter than women, and 16% less than women at mass merchandisers. However, the economy may soon start to return unemployed men to the workforce, pushing more of the household shopping duties back toward women. Earlier this month, the U.S. Labor Department reported that the unemployment rate had fallen slightly to 8.9% in February from 9% in January and 9.7% in February of last year. Last month's unemployment rate was the lowest since April 2009. More good news for retailers? 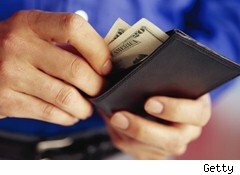 Men aren't as cheap as they used to be, according to the Nielsen report. In 2010, men spent about 25% more at grocery stores -- and 20% more at mass merchandisers -- than they did in 2006. "Women are the biggest spenders per trip, an indication that they are more likely to go on the weekly planned shopping trips for their families," Nielsen says. "But in many channels, the difference between the spending of men and women is not that great."